We are on a road trip to South Carolina but I simply had to share this recipe with you all while I’m gone. 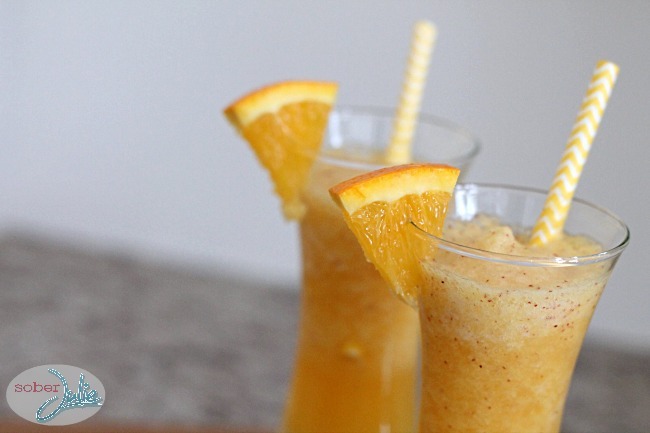 Recently I was running a bit late in my day which meant that I was still working on my Fuzzy Navel Mocktail recipe when my daughters arrived home from school. The girls always love when this happens, I allow them to get involved and taste test each and every mixture. It does slow me down but it becomes somewhat of a family event. Once I was finished, I left all of the fruit and other ingredients on the counter and went to take a phone call. 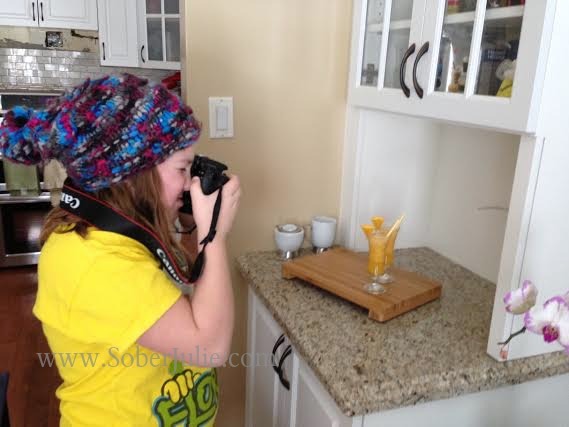 When I returned to the kitchen area, I found my darling 10 year old with my coveted dslr camera strapped around her neck bending over something on the counter. Stifling my urge to scream out “NOOOOOO”, I took a deep breath and decided to be a calm, encouraging Mom. I quickly realized what she’d done…she wasn’t just playing, she’d actually put some thought and energy into what she was doing! My kid had made her own smoothie recipe, set up a photo shot, dressed the glass with a garnish and was trying to get some photos! SHOCKED. I was utterly shocked to see how much my child had absorbed from working on recipe development with me. The instant pride that filled me still lingers today as I look at this photo I snapped with my phone. This 10 year old has only had 1 photography class at school and managed to pull this together. 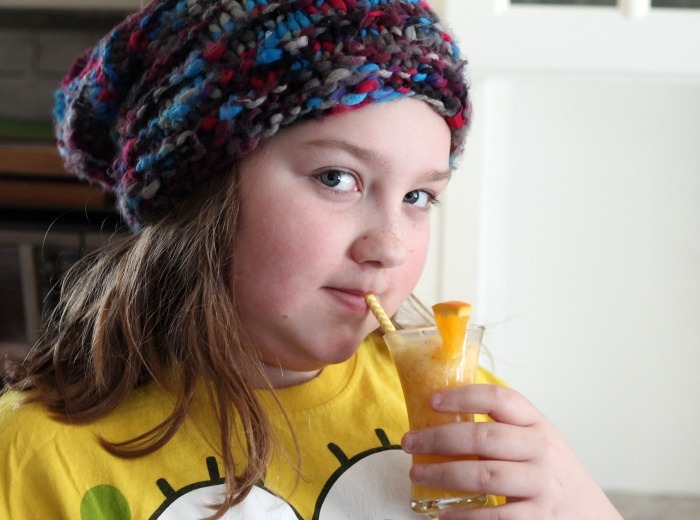 Sydney realized I was in the room with her and excitedly told me all about her Orange Peach Smoothie recipe, why she chose the glass she did, how the light works for her and kept snapping away. I asked to see some of the pics and was flat-out impressed. Some were at odd angles but she liked the result, she said it shows off the bubbles and skin from the peaches. Well she’s right on that one! After some taste-testing I just had to share the recipe with you! I’m proud of her and all of these photos were taken my my amazing 10 year old daughter, Sydney. 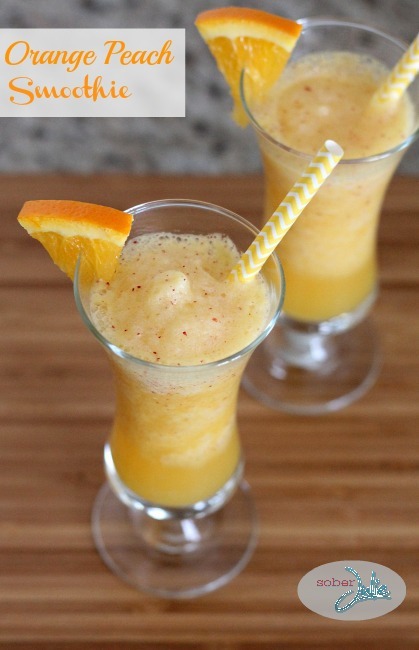 Place juices, ice, peaches and orange into your blender and blend on medium speed until smooth. If you could all leave Syd a message of encouragement, I’d appreciate it! Syd, you impress me more and more every time your mom shares a story about you. This summer – you, E2, and that cottage kitchen. You game? Wow great job and looks delicious. 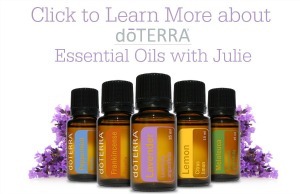 Cant wait to try it :)…yummy perfect for in the summer time to. Looks very tasty. Love the fact that it is dairy free. Will definitely have to try this recipe. Kudos to you! Yum!!! This looks delish!! And I, for one, will most definitely make this!!! Double yum!!! Great job!!!!!!!! I will try this soon! I just Pinned it under Yummy! Thanks! Looks delicious, and excellent presentation. I will have to try this. Bravo! oh that looks mouthwatering Sydney!! Excellent job little lady! I can’t wait to try out your recipe this weekend when my daughter returns home for a visit from college. She’s a smoothie freak! Thanks again Miss Beautiful! Love it! You better make me one of these Syd when I come to visit :) Mini food blogger in the making! This looks so yummy! 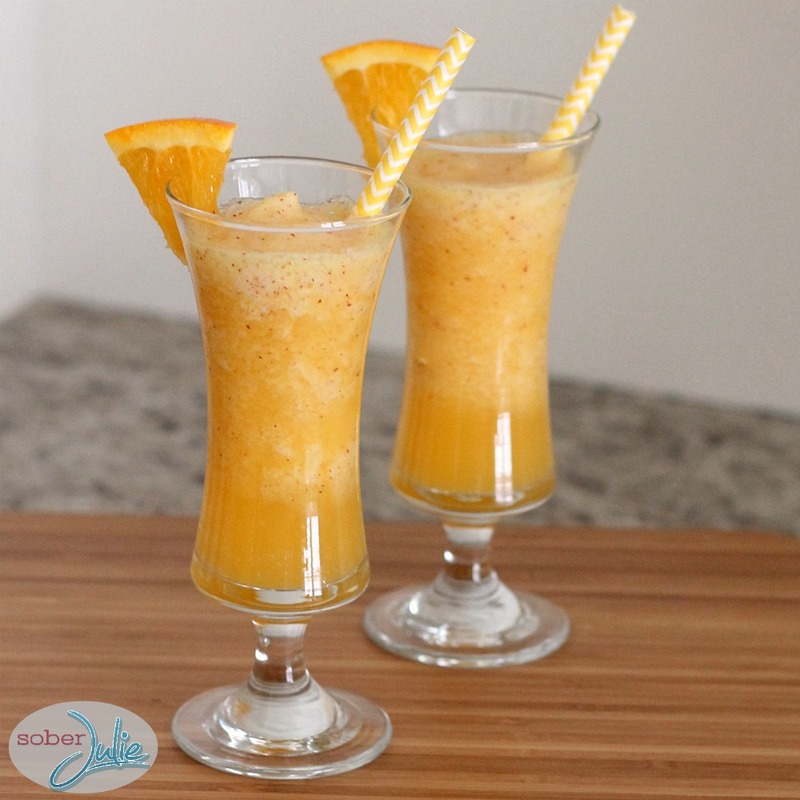 What a great recipe, packed full of vitamins too :) great job! Ooh, that looks delish! I thought it was cinnamon I was seeing in there and then read the recipe to discover it must be peach skin. Or peach fuzz? ;o) The deco is great too. I guess mom’s new kitchen is inspiring to everyone in the house. Bottoms up! Recipe looks terrific . I’m going to try it as soon as the snow disappears!! So proud of Sydney. Great thoughts went into this fabulous recipe, great pictures too! Cannot believe that you know so much about Nuitrition. So very Well Done Sweetheart. Love your Grandparents in ORANGEVILLE and Lady Cocoa, who is currently drooling all me and your Grandad too, lol! PS: Great Blog, Thank You. sounds delicious, will have to give it a try. Wow that looks and sounds delicious! I have been loving oranges lately. will try this for sure! fabulous pictures and my mouth is watering, I can’t wait to try this recipe! Great job. Well done Sydney, she was creative in the recipe, took care in presentation, it sounds great and looks wonderful. As a young person creating a very healthy recipe, I am really impressed with you and your creation, Syd! Wow looks and sounds great! You got a budding photographer and smoothie maker there! If I hadn’t read this article, I would’ve thought a professional did it. She’s awesome! Sounds yummy! Good for your daughter! Looks fabulous !! And making my mouth water just looking at the picture, delish !! Hi Julie … I am going to try Sydney’s smoothie … looks delicious. Question: Did you make her hat? I LOVE it! Would love to have the pattern and info about the yarn … beautiful! One more question … I live in Michigan and don’t remember seeing fresh peaches in the grocery store lately … any ideas what I could do to get good flavor, besides just adding some canned peaches? Great job! Beautiful. My husband saw this and wants me to make it. Awesome! Sounds yummy and dairy free is awesome!!! Looks good…it was the picture that drew me to check out the recipe. LOVE her hat! Did you make it? If so, I would LOVE the pattern. I make and donate hats to charity … missions, etc. This is very attractive and looks like it would knit up quickly.